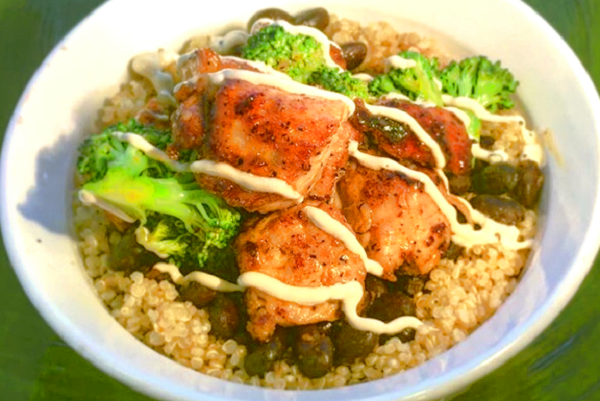 Sweet honey and spicy sriracha meetup in this delicious chicken bowl that's loaded with healthy broccoli, black beans and served over protein packed quinoa. So good! Coat a pan with oil and heat on medium high heat. Saute chicken 5-7 mins or until cooked through. Add sauce and broccoli and cook on high for an additional 2 minutes until sauce becomes a glaze. Reheat quinoa and beans. 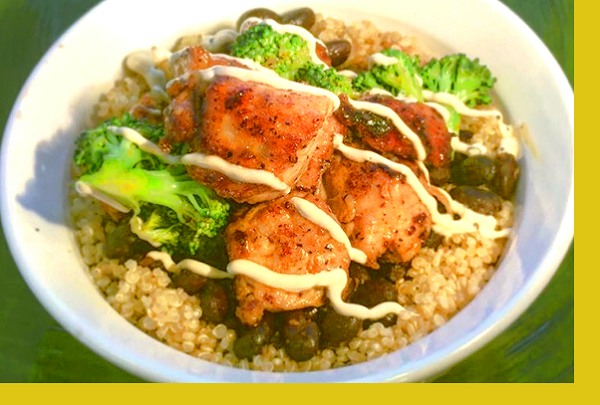 Place quinoa in your bowls first, add beans, then chicken / broccoli mix and top with soy cream sauce. Not my favorite but I did like the menu variety. This was very delightful to come home to. Everything was so fresh and it was easy to finish. No muss, no fuss! Loved this easy, healthy weeknight meal. Even my picky husband and the kids enjoyed it.